Trekking poles are an often overlooked piece of hiking equipment. Those who are new into hiking may not realize just how big of a help they can be, while those who have hiked for years without poles probably believe they don’t need them. However, the truth is that a great set of trekking poles can help to reduce joint pain, grant stability and safety, and give you more power to get through your adventure. Many outdoor lovers are into trekking because they are driven by the challenge of the hike as well as appreciating nature’s wonders. Oh, and when you just want to go for a day hike, this guide will has your poles covered too. ​If you’re ready to try adding something special to your hikes, then trekking poles might be just what you need so you can enjoy the outdoors even more! 1. How to Choose Trekking Pole Types? 2. What Size Trekking Pole to Choose? 3. What to Look for in Hiking and Trekking Poles? 4. What Are the Tip and the Basket? 5. How to Use Your Poles? 6. How to Adjust Pole Size? ​Our complete guide to trekking poles will give you information about how to choose trekking poles, the answers to some commonly asked questions, and reviews of the best of the best trekking poles of 2019. ​The TrailBuddy Trekking Poles is a set of aluminum-based trekking poles that provides support, stability, and strength for all hikers on many different types of terrain. The TrailBuddy Trekking poles have an aluminum-blend core, which is lightweight and sturdy. While this material has some flex to it, it can be challenging to break even if you are putting a lot of weight on the material. Using two basic locking mechanisms, you can alter the height of these poles to suit the uphill, flat, or downhill section of the trail that you are currently working your way through. Similarly, this allows you to adjust it according to your height. Additionally, this product comes with a set of different types of pole tips. These tips (including snow baskets and mud baskets) allow you to deal with varying terrains with ease. The mud and snow baskets help to give you good grip no matter what the ground surface type is like. ​One thing that most will love about these poles is just how easy they are to fold and store when you are not using them. The poles can be simply collapsed down to a small size of just 21 inches, and that will be easy to tuck away or even pack in a suitcase when not in use. Another great thing about these poles is the degree of sturdiness that they can provide without splintering and snapping. Even if you put too much of a weight on these poles, they will not bend or break easily, so you can rely on them to get you through hikes with a lot of vertical areas. ​One of the biggest concerns about using these particular poles is that the cork grips aren’t the best quality, and they aren’t suited for all weather conditions. While they can work well when you are hiking in hot weather, you won’t find them as useful in cold weather or if the cord begins to break apart. ​Our next set to look at is the Cascade Mountain Tech ​Foldable Trekking Poles. These high-quality poles rely on the 100% carbon fiber core for their strength and stability. As mentioned, this is a 100% carbon fiber trekking pole. As such, this pole is lightweight and durable, but it is possible that you could see some splintering of the poles in very high-stress conditions. Overall, though, they are strong enough to keep you safe during your treks. The poles are also adjustable and Foldable. Using the quick-lock technology on each pole, you can easily adjust how tall the poles are or prepare them for storage. The simplicity of the locks makes it very quick and easy to do this. This set comes with a few different types of pole feet that are made for different conditions. There is also a carrying bag, so it can be very easy to store and organize where all of the components of your set are. ​One of the best things about this product is that you can choose either a cork grip or an EVA grip. This is an excellent design as you might prefer one or the other depending on the conditions that you are facing while you hike. ​Many people find that these trekking poles could have better construction. Both the screws on the bottom of the pole and the simple lock for the adjusting mechanism loosen very easily, so you might find this frustrating if you have to keep adjusting it during a hike. 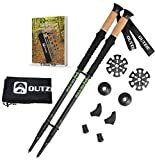 The OUTZIE Trekking Poles comes with two telescoping poles that are made of aluminum and have an adjustable size as well as can be disassembled for packing, depending on your needs. This is an aluminum-core set of poles that uses a combination-type grip that is not commonly found on hiking poles. The grip is made out of both cork and EVA foam, so it is comfortable, water-resistant, and conforms to your hand in just a few uses. The durability of these poles is outstanding. The aluminum does not bend easily, but you may find that it can dent easily if put into the wrong spot. While denting isn’t a big deal, it can cause some issues with how the adjustable mechanism or telescoping features work. This is the only set of poles on our list so far that has an anti-shock system that can be easily turned on or off depending on what you are doing on your hike. This feature can give you enhanced stability, particularly when you are hiking on loose terrain. If you have an injury, this feature is a must-have for lessening both pain and fatigue. The biggest issue with these poles is actually the unique grips. They can become loose very quickly and may even slide down the pole if you do not notice this happening. This can be really quite dangerous and should be attended to quickly if it happens. These BAFX Products Trekking Trail Poles is a set of aluminum core trekking poles with ergonomically designed grips that will help keep moisture at bay. The core of these poles is made of aircraft-grade aluminum. This aluminum is one of the most inexpensive materials that can be used to make trekking poles, but it is also one of the most reliable. They are also lightweight and durable. The poles can be adjusted between 25.5” and 52” by simply unlocking the poles, adjusting the height, and locking them again. Each pole weighs in at 12.4 ounces, making them light but not an ultralight set of poles that can be good for many hikers. The anti-shock features of these poles make them super useful for every trek you make. You will feel a big difference in the fatigue and stress that you feel when you are hiking because the anti-shock coils absorb so much of the impact while you are moving. The tips are built to absorb shock for more support when hiking and can be used by people who have back and knee problems. There is an added spring when the poles are hit on a hard surface that enables the user to exert less energy. The product has wrist straps that are made of mesh and the baskets are built for snow and mud. They are easy to pack and convenient to bring while travelling. The aluminum material makes the poles rust and corrosion free. The material makes the poles strong and they will not bend when hit with hard materials. The tips grip well to the ground and can even gain traction on muddy or slippery roads. The grips are made of rubber and foam that makes the grip comfortable and tight. Even heavy and large-sized users can use this pole for support because of the strength and stability. There are two big issues with these poles. First, the straps do not stay tightened around your wrists as they should, so you will have to adjust them frequently. The product’s wrist strap is too thin and short. If the user is wearing gloves, it is no longer wearable. Second, the poles are likely to collapse under a lot of pressure. While they are adjustable, the adjustment doesn’t always hold completely: the locking mechanism uses a twisting lock that unfastens unexpectedly. 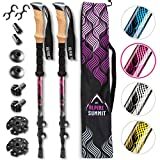 ​Lets check out the Alpine Summit Trekking Poles. These aluminum poles come in different colors and are lightweight. These trekking poles from Alpine Summit are made from 7075 aluminum, an aircraft-grade material that is very common in trekking poles around this price point. These poles are less lightly to break than carbon fiber, but they aren’t as lightweight. Still, 7075 aluminum is lighter than the cheaper 6061 aluminum that is in low-grade trekking poles. Rather than the need to deal with so much weight on every hike, you can instead find that these give you very little fatigue. As similar to the products included on our list, these poles have an adjustable height. With the flip locks, you can easily manage the size of the pole to be between 25 and 53 inches. This makes it a good set of poles to use no matter what your height is. The best part of this package is that the poles come with a unique set of tips that can make your hike easier. From tungsten-tipped pole feet to anti-shock rubber tips, you’ll find that you can conquer any terrain by simply adjusting which tips you are using with the poles. The biggest issue with this set is similar to the problem that we saw in the OUTZIE Trekking Poles. The grips on these poles are not as well sealed as they could be, so they can easily break off and slide down the pole if they are not re-secured with some glue or new screws. This can be very frustrating. The pole is strong and can be used even by tall trekkers because of the long length. When going uphill, the poles can be shortened and going down the trail is manageable because the poles can be extended. These poles are durable and strengthened by their aluminum and the tips are made of tungsten carbide. The straps hold securely and will not slip off because they are made of nylon. The trek is more secure and the user maintains balance because the poles are sturdy and well-balanced, as well as lightweight. The poles can be adjusted quickly and they come with a free lifetime replacement promise--it doesn't get better than that! Holding the pole will not cause hand strain because each pole only weighs 9.6 ounces and the grips are made of comfortable foam. The handles are also durable and will not wear out even after years of continued use. The poles are easy to retract and extend. The lock is a push button and extending the pole can be done with one press. If the user is caught off balance, the quick extension feature will catch the user before falling off. ​The locks do not hold well when extreme pressured is applied. When hitting the ground, the tips make a cracking noise. These Z-shaped poles are the distance hikers choice and like our last entry, the Black Diamond Distance Z Trekking poles are foam gripped and carbide tipped. ​These are high-tech poles that are structurally sound because they are made of carbon and the tips are pointed for easier penetration to the ground. The pole is extended by a push of a button and snaps easily in place when the desired length is achieved. ​The poles are light at only 9 ounces each and they stretch as far as 52 inches. The product’s connectors are made of rubber and will not rust or lock when extended. The tips are protected with a rubber shoe that can be detached if the user wants greater force. The user is secure with the firm rubber handles and will not slip off because they can be held well with wet hands. The wrist straps are lined with absorbent cotton and mesh that keeps the poles in place. The tips have good traction on most surfaces. The product comes complete with mud and snow baskets, which makes the product usable in any kind of weather and terrain. ​The manufacturer wanted to make a product that is easy to extend but the connectors are flimsy, which makes the pole extend even when the lock is not released. Even when the product is used on soft surfaces, the locks release the shaft. ​This product is made by a smaller company but they were still able to create a stable and reliable product made of ​100% carbon fiber. ​​Light weight and shock absorbing thanks the carbon fiber shaft. The light weight makes these poles suitable for long treks--where the heavier poles would cause fatigue to come sooner, ​​​the Hiker Hunger carbon fiber poles will allow you more happy hours on the trail as you're making your through hike. The product is ultralight at a weight of 7.6 ounces. The poles have ​a maximum extendability to 54 inches. When folded, the poles at their minimum extendablity is 24 inches--yet they can be separated to reach a minimum packing length of 21 inches. The poles are sturdy and rust resistant. The product is complete with rubber covering, mud and snow baskets. The grip is made of cork and a secondary lining is put underneath for added grip. The cork absorbs sweat and follows the shape of the user’s hold. The locking mechanism is convenient and safe because it is an easy snap on clip that can be moved even when the user is wearing gloves. Trekkers who are six feet tall will not have a hard time adjusting the pole because it is long and retains strength even when it is extended. The poles come with a transportable bag or can be put in a backpack for transportability. ​The screws on the poles require frequent tightening when in use for long periods. Like many of the other poles in this ultimate guide, under extreme or unusual pressure the carbon fiber poles can break and the tips have a tendency to break off. Foxelli trekking poles are made of carbon and are a great product to use outdoors. The poles are very light at seven ounces and are very easy to carry on a long trek. The length of each pole is 24 inches when folded and 55 inches when extended, which makes it suitable for use by tall trekkers. The pole is easily adjusted and released with one adjustment of a switch. The product’s rubber boots can be used on rocky paths while the mud and snow baskets are large enough to stop the pole from sinking. The tips are made of tungsten carbide which is solid and will not break or chip off when hit on a hard surface. The product is lightweight and compact. It can fit any standard sized backpack. The grip is made of cork and will absorb sweat and water. The shaft is covered with foam for additional holding support. The product has a three-year warranty and a generous no questions asked guarantee of full cash refund or a product exchange in 120 days. So, you virtually take no risk of being dissatisfied when you purchase a pair of Foxelli Trekking Poles. 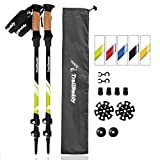 If you are a first time user of these poles, ​the adjustments take some effort to get right--play around with them at home before heading out on the trail so you don't get stuck stuck fiddling with them trail side. The cork handles can chip away from overuse. Whether or not you have used trekking poles before, you may find that it is difficult to figure out which set is the right choice for you. What do all the different words (like carbon fiber or ultralight) mean when it comes to trekking poles? We’ve got the right answers to these questions, and more! The love for the outdoors has also led to the development in the design of hiking gear and the use of state of the art materials to make hiking more enjoyable and safer. High tech advances in hiking gear has led to a more ergonomic and secure trekking poles that are lightweight. Most trekking poles now only weigh between six and 10 ounces. It’s the manufacturer’s use of aluminum, copper, and design which advanced the dual purpose of lightweight and safety. Aside from weight, trekking poles have improved characteristics to make the trekker safe and secure while hiking–allowing hikers to maintain support and stability during a trek. Poles are now designed to withstand impact, changes in climate, rust and corrosion. There are trekking poles which can be extended to 55 inches and can be folded to fit into a 24-inch shaft. Because trekkers need ergonomic and lightweight gear, manufacturers have made the pole retractable and compact so it is easy to fit in a suitcase or put in a backpack. The pole is then stretched and locked with mechanisms that will put the joining shafts in place and will keep the pole sturdy even under impact to the surface. There are various types of locking mechanisms. There are external lever locks that are switched to lock the pole when it reaches the desired length. There are locking mechanisms that work with a push of a button and there are locks that can be twisted. The most durable of these is the twisted lock because the lock keeps the pole sturdy even when the lock is in place. The twisted lock keeps the pole stable and will not let the pole retract or extend unexpectedly. The trekking pole has a handle that is made of either cork or foam. Some poles have both. The advantage of using a cork handle is that it absorbs sweat and is contoured to the user’s hand over time. The grip that is lined with foam is also firm but will not absorb sweat. Other trekking poles use both; the foam lines the shaft beneath the cork handle for added grip. Trekking poles also have a wristband that serves as a backup if the user accidentally drops the pole. The wrist band will keep the pole within the users’ reach. The different types of trekking poles on the market are typically separated by the various features that they offer. While all trekking poles are sold as a pair and should be used in tandem, the specific types of support that they can provide will differ depending on what type of poles they are. Some trekking poles can be adjusted in length, and some cannot. The ability to change the height of the poles is useful for matching your height as well as for getting better stability on different types of terrain. Shorter poles are better for climbing uphill while longer poles are better for the downhill stretches. On the other hand, fixed-length poles are usually lighter and work perfectly on hikes when you know that you will not need to be able to adjust the length to use your poles effectively. These poles can be unlocked and fold up similar to the way that tent poles fold up. These are very light, can be easily stored, and an excellent choice for anyone who wants the option to use poles without needing to carry them at full length all the time. If you have any hip, leg, or feet injuries, having a pole that absorbs shock can really make a big difference in the quality of your hike. These poles usually have an on-and-off feature that can be used when doing downhill treks, helping absorb the extra shock. On the contrary, standard poles are less expensive than those that absorb shock. They are also usually lighter. Even though they are not designed to absorb as much impact, they still provide stability and balance. Ultralight poles are, as their name suggests, lighter. They are easier to use, cause less fatigue, and are usually easier to pack. In most cases, ultralight poles are defined as those that weigh less than one pound. As mentioned in the ultralight type section above, the weight of your trekking poles can affect how useful they are. The weight of the pole is usually determined by the core material used in the poles. That said, lighter isn’t always better. If you’re going or planning to put a lot of weight or stress on the poles, using something mid-to-heavy weight can be better in order to support you. The material type, rather than the weight, is the most critical deciding factor. Trekking poles are made out of many different materials, but some of these materials have become preferred by hikers and walkers all over the world for their superior strength or their weigh trade-off. Aluminum: This is a durable, economical choice. Various gauges are available, and the exact gauge will decide the weight of the poles. These poles can bend, but they shouldn’t break even in high-stress situations. Composite: Composite poles are made entirely or partially from carbon, and they are the most expensive option. This price comes with the payoff that they are very light. However, these can splinter or break more easily than aluminum, but they can help to reduce shock vibrations. Every set of trekking poles will have a grip on the top where you will hold onto. The grips can be set at various angles, so you will want to find which one helps keep your hand in the most comfortable position. Cork is common for hot-weather hiking where you expect to sweat a lot. This type can conform to your hand shape. Foam grips might be the most common, and they can also work well for sweaty hands. These grips are soft. Rubber grips are ideal for cold-weather hiking because they can insulate your hands from the cold and protect them from shock. In hot weather, rubber can cause chaffing or blistering that could be painful. You should always check which type of locking mechanism the poles use. For poles with adjustable length, the lock keeps them from sliding between lengths. In non-adjustable length poles that collapse for storage, the locks prevent the length from slipping while you hike. If you can, try visiting a retail storefront to try out these types of locks and discover which kind of locks works best for you. Some can be more difficult to get used to than others. A trekking pole’s main function is to provide support to the user while on a journey. The poles act like extra legs that absorb the energy of the user and make the walk more comfortable and stable. With every step, a pole decreases 11 pounds of weight off the users’ body. This will enable the user to walk faster and with less effort. The pole is also good for supporting the user when going uphill or downhill and will make the user stable when the surface is uneven. The first step in using a trekking pole is to adjust its height. For users who are under six feet tall, a pole with a length of 47 inches is appropriate. For users who are more than six feet tall, the pole should be extended to 56 inches. Users should make sure the wrist strap is worn before grabbing the handle. The elbow should make a right angle when holding the pole. The length of a pole will vary depending on the use. Shorter poles are generally used when going uphill and longer poles are used when going downhill. The angle of the elbow should always be 90 degrees to ensure that the arms and elbows are not strained. If the pole is raised, then there is more energy required when using it. When walking upwards, the handle should lean towards the forward direction and the tip should be closer to the user’s feet. This is done so that the trekker will have more force to push forward. When the trekker is going downwards, the tip should be far away from the user and the handle closer. This is so that the user will get a stable footing while the force is transferred downhill. A hiking pole can be used for support for the user in tackling various types of terrain. The pole can also be used to sweep rocks and twigs that are blocking the road. When getting tree branches and tall bushes out of the way, the pole can be used and is strong enough to sway obstacles out of the trekking path. The pole can also be used to deal with poisonous and thorny bushes that can’t be touched. 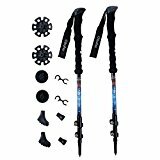 Choosing the type of trekking pole that you want is the first step to getting a set of trekking poles that will really work for you. If you’ve never used poles before, you might have a hard time deciding which type makes the most sense for you. If you do have hip or knee problems, choose adjustable, shock-absorbing trekking poles. This type of poles will give you different amounts of support for different terrains while still absorbing some of the impacts of hiking. This will help you feel less pain on the trail. If you want to keep your pack as light as possible, stick to ultralight trekking poles that can fold up. This will make it easy to store your poles when you need to while still keeping everything light for your trips. If you are only a casual hiker, stick to a standard, aluminum trekking pole set until you learn more about trekking poles and get deeper into this hobby. There’s truly no reason to spend a lot of money if you aren’t ready for that commitment! If you are choosing an adjustable set of poles, you do not need to worry about the specific height of your poles as much as those buying non-adjustable poles need to. While some adjustable models come in base sizes, you can usually adjust them to fit your needs. For non-adjustable poles, you should choose the length depending on your height and the type of terrain that you are usually working your way through. Of course, you might find that the suggested lengths do not work for you. If that is the case, you may want to move to an adjustable-height trekking pole so that you can always have the perfect fit for your next adventure. The end of the pole is called the tip. There are manufacturers who build the tip with tungsten to make it solid and corrosion free. The tip is pointed so that the pole can pierce through rough surfaces with more intensity. They are also protected by various types of rubber coverings and will depend on the terrain. Some rubber covers have tread so that the tip will have more traction as it hits rocks and gravel. There are users who use the tip cover as the pole’s shoe. There are tips that are built to absorb shock and come with a built-in spring. The basket is an attachment that is made of plastic. It is attached to the pole’s tip to prevent it from sinking in the mud or snow. These accessories are detachable and can be removed if necessary. Using trekking poles doesn’t have to be difficult, but still, some people invest in these poles and then have no idea how to actually use them properly while out on the trail. As you can see, you’ll eventually find the technique that works best for you. Adjustable trekking poles are a great way to be able to have a versatile pole that works in every situation, but using the adjustment feature might not be intuitive to you the first time that you pick up the poles. A hiking pole should be purchased based on its ability to perform in extreme weather and rugged terrain. The pole’s durability and efficiency of its locking mechanism are the primary factors that need to be considered before buying the product. The poles should also pass wear and tear conditions and should not be easily bent or broken at strong impacts. Some outdoor manufacturers might charge a higher price because of the name but not be reliable when used on long hikes. The user should take into consideration the materials used to make the product and should not be easily swayed by brand names and popularity. As you can see, there are many good options among the best trekking poles of 2019, but which are the very best? We’ve found that the TrailBuddy Trekking Poles offer the best blend of balance, price, adjustability, and durability. These poles are also designed to work on any terrains.